In July of 2017, Zoho launched Zoho One, a suite of 40 business apps that would work together and share data, ranging from email to sales to support. Now they have made it even better with the integration of their own AI, named Zia. Zia has already been available to Zoho CRM users for two years. Zoho introduced an upgrade, Zia Voice, in February of this year, and now it has been expanded even further to work with all of the Zoho One apps. … and What Does She Do? Zia’s primary purpose is to intelligently automate the sales and service, using your workflow rules. She analyzes as she automates to see how effective your sales techniques are and how you can improve them. She can notify you of the ideal time to contact a lead/contact so you can save time instead of playing phone tag. She also identifies and reports anomalies, for example, she may stop you from sending two email templates to the same customer on the same day, or ask you if you left out a detail while making an appointment. Zia is an expert on her own CRM, and subscribers can call up Zia with a voice command to answer any questions and give tutorials related to any module in Zoho CRM. This saves subscribers the time it would take to search through a knowledge base and get right to work. Among other automated tasks, she can also make charts from CRM data, change the status of a task, or add data to a sales lead’s profile. Users can talk directly to Zia instead of spending time loading the correct module and scrolling through different windows. You can even teach Zia your own company’s branded product names. What Do We Mean by Analyzing? Believe it or not Zia can use your sales numbers to predict the future. Well, at least your future sales. 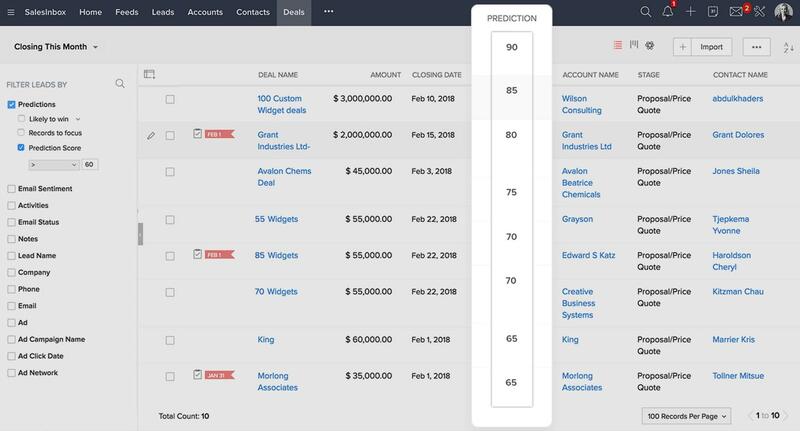 Zia takes the data, including your own behavior and the responsiveness of the lead, and calculates the probability that you will be able to close the deal. Not only that, but Zia can break down deals as “trending” up or down, depending on the chances of the deal closing soon. 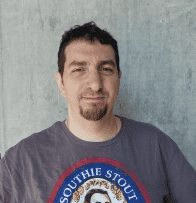 Zia will put the most timely sales leads right in front of sales reps.
We’ve talked about what Zia can do, but so far we’ve only talked about how she works with Zoho CRM. 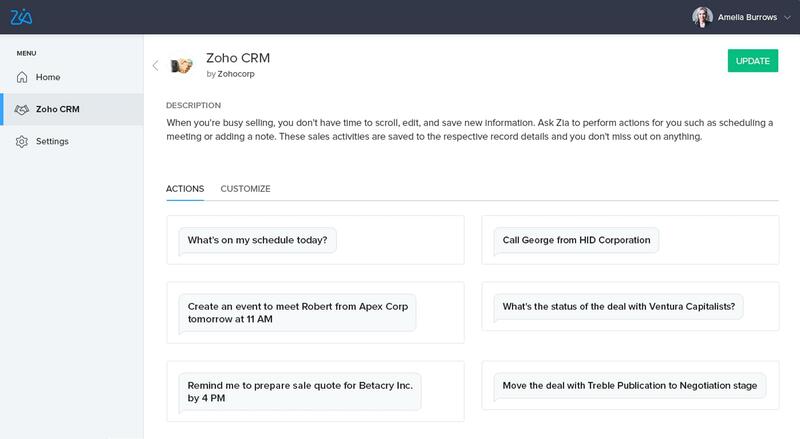 Now that Zia has been expanded to work s across all of the Zoho One modules, not just CRM, she can provide contextual information based on the data contained in many of the different apps, and pull together a more complete customer profile. But the integration goes far beyond adding more information to the customer, it also analyzes the information across the different platforms. This way, you can see what social media campaigns are working, or see how many products in the sales funnel also result in a customer service ticket. This way, you can identify successes and failures. Don’t forget that since Zia is a natural language processing engine, it can analyze language across all of Zoho’s modules. I’ll give you an example to show you what I mean. Sentiment analysis, as the name suggests, it is the process of an AI using context clues to decide the emotional state of the customer. Zia can both analyze your organization’s own service tickets and emails so you can create a better customer service experience, and monitor social media for more effective social listening. If you first engage a customer on social media and then contact her or him directly, you won’t lose a step. Zoho One keeps track of every interaction, so no matter what channel you use to contact the customer, and when you go back and forth across different ones, all the information will still be in front of you the whole time. You can give your customers a seamless follow-up any time you contact them.